I was in middle school and high school and I was in the size 14-16. It was very different 20 years ago, because there weren’t really cute plus size clothing stores around like there are now. My cheerleading uniforms and dance costumes had to be made by a seamstress because I couldn’t fit into the general sizes. I felt like the outcast when I went to the stores with my girlfriends. I was not confident in my own skin, and I always tried to hard to be accepted. My family never made me feel like I should be thinner or change; being heavier was always something that made me uncomfortable, sad, isolated and inferior. I believe that I let things get out of control in my romantic life, because I wanted to see if someone else would love me the way I was but I didn’t love me the way I was. I actually lost the weight twice. The first time I went to college and decided to make a change I lost about 75 lbs. When I was in college I was not mature enough to understand the preciousness of the gift I had been given. So then after a couple of years, I gained it back plus some more. I went to Miami before I celebrated graduating from college, and someone took a picture of our group of friends; I saw how much I had gained and how much I was trying to hide the sad and unconfident person I had become. The second time around, I prayed that God would lead me to where he wanted me to be so that I could stop using food as my comfort. I started again after I graduated from college. I was dedicated to eat within a healthy caloric budget and I stuck to it. I began journaling my food just the way I did the first time around. Now there are apps that help us track our calories, but I did it the old fashioned way (with books). I went for walks every day. I decided to ride a bike that was in the garage, and that started a wonderful upward spiral. I loved being outside like a kid and it made me so happy to ride my bike. The pounds melted off and I was able to begin jogging little by little. I will never forget how great it felt to run my first mile without stopping. I felt like I won the gold medal in the Olympics. It took a year before I saw the difference in my body. I lost about 60 pounds the first year. Very slowly. All of my habits changed. The biggest challenges have always been others telling me that I don’t need to lose weight. This is extremely unsupportive. When I hear people say that, I think that they really don’t understand what it’s like to look at yourself and not like what you see. Another challenge was the places and people I used to be around. Going to bars and restaurants had to change; so some of the people I was around didn’t seem comfortable with my lifestyle change. I seemed to still be an outcast but then I was able to start a new circle of friends that were supportive and had similar interests. The second time I lost weight I decided that I would do whatever it took to maintain. I have had some months when my weight has gone up, but more times that not these past 8 years have been successful. I look at how far I’ve come. My family encourages me and sees how badly I want to maintain, so they will ask me if the food on the menu works for me. What keeps me going is visualizing myself the way I want to be, not just in looks, but happiness within myself. The hardest thing in weight loss is a plateau. It seems like you’re doing everything wrong. I see advice from others. Even if I don’t like the advice, I take it. When I hit my first plateau I had just gotten under 200 lbs, my father (a retired professional athlete) said “you need to run and you need Tae Kwon Do.” I started running and another 40 lbs fell right off. After I reached 160 lbs I was able to train in Tae Kwon Do. I always keep challenging my mind and my body. Stagnant is bad. The best is being able to cross my legs. I love compliments too. I remember how great it felt to get on an airplane and not feel squished in the seat. Bending over to tie my shoes was easier. I drove a stick shift at that time and even driving was more comfortable. The feeling of waking up and knowing that I reached my goal and it’s not impossible to keep going. Deep fried food is gone and it doesn’t even agree with my stomach anymore. I stopped eating at all the fast food restaurants. I have been able to find a way to enjoy the food I like without feeling deprived, but I no longer crave the binge foods. The more weight I lost the more I was able to do and therefore I enjoyed it more. I was probably active 1-2 days per week and now I am active six days a week. Make realistic goals. If you’re not already exercising once a week, then just start with one day a week. If you try to start with 5-6 days a week and then you miss one or two you might get discouraged and beat yourself up. Speak with a professional about the food. Not eating enough or eating too much will not help. Sometimes you need two or three opinions before you find something that will work for you. Keep going! No matter how long it takes or how many mistakes you make along the way, keep going. You have the rest of your life to get it right; so don’t put any pressure on yourself to lose weight by any particular time frame. If you don’t get to the number you want in “x” amount of months will you give up? Believe that you are already at your goal weight. See yourself at the store happy, see yourself in your new skin. Visualize it all the time. 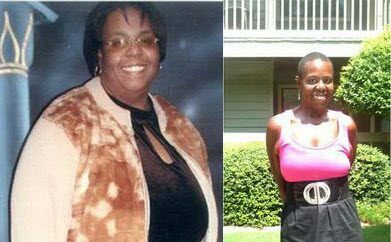 This is one of the best before and after pictures I’ve ever seen. Congrats and keep on keeping on! You look awesome good for you! Omg I feel we have so much in common. I lost 90lbs and kept it off for about 5 yrs but now I’ve gained about 60 lbs back and I feel sooooo bad. You gave me hope that I will be able to do it again! Wow!!! What a transformation! She looks stunning! great job,I know how hard it was!! Wow ! 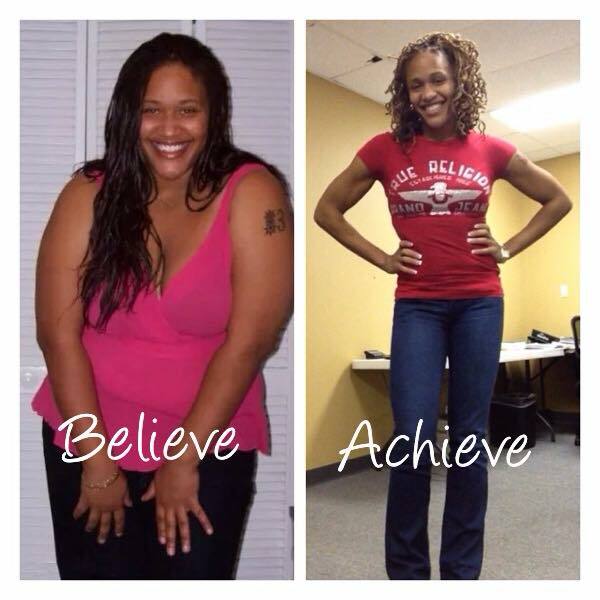 Great story great job you look amazing! Great accomplishment. Looking great also. Good tips. Easy to follow and make sense. You were gorgeous before but..now…WOW! What was you calorie budget? Great story and very awesome too. U look good. Congrats! Just Awesome, You Go Girl!!!! Strong & Gorgeous…!!! You go Girl! You look fabulous!! 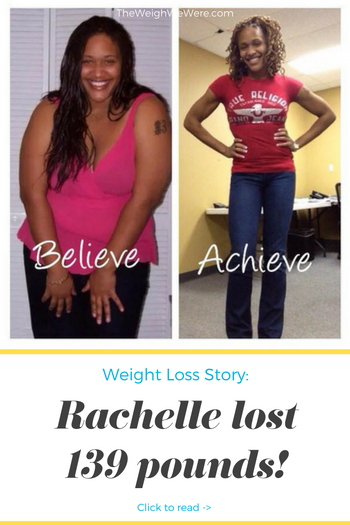 Wow absolutely love your story it hit home for me great job – you look gorgeous !